Someone has been sending hateful and threatening messages to members of the Norwegian Labour Party’s youth organization AUF, seven years after it was targeted by a right-wing extremist who gunned down scores of young and aspiring Labour politicians at their annual summer camp. Police have now launched an investigation into the anonymous threats, with those involved facing prison terms, fines or both. “Many of these messages are extremely harsh and amount to pure death threats,” Monica Lillebakken, leader of the Oslo Police District’s hate crimes division, told newspaper Aftenposten. The police probe into who’s behind them, and why they suddenly escalated earlier this year, was launched after Aftenposten’s weekly magazine A-magasinet reported late last week on how many of the survivors of the massacre at AUF’s summer camp on the island of Utøya on July 22, 2011 keep being targeted, again and again. 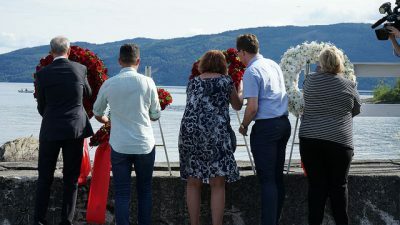 The latest batch of threats has come in the months and weeks prior to last weekend’s annual memorial ceremony honouring victims and survivors of the July 22 attacks and AUF’s next summer camp gathering back on Utøya that begins next week. Hussaini is soon likely to be succeeded by the now 28-year-old Ina Libak, who survived being shot in her arms, jaw and chest on Utøya. She has also received threats, one just after she spoke on Norway’s May 1st Labour Day about the hatred and conspiracy notions directed at the Labour Party. Yet another anonymous harasser wrote to AUF camper Tarjei Jensen Bech, who also was shot by the anti-immigration extremist Anders Behring Breivik but survived, that it was “sad Breivik didn’t aim better.” One message written in Swedish warned Bech that “the next time you round a corner it will be me with a magnum and then you are DEAD, pig that you are Terjei,” misspelling Bech’s first name. The message was accompanied by three illustrations of guns. At the urging of Norway’s state police, Bech reported the latest “you should have been killed” threat against him last spring to police in Finnmark, where the 26-year-old from Hammerfest now works as deputy county governor. He was equipped with an alarm box to wear around his neck that, when pressed, will summon police. Shortly thereafter, however, he received a letter from local police saying his case had been dropped because police were unable to determine who had sent the threats. Terje Daae, a prosecutor for the Finnmark Police District, told A-magasinet that police take such cases seriously, but the false email addresses and cash cards used to send the text threats to their recipients’ mobile phones make it difficult to identify those who, in reality, don’t want to be associated with their own words. That’s often been the case in all the other threats sent to many others who survived the massacre on Utøya. A-magasinet reported that there was a wave of such hateful messages earlier this year, just after then-Justice Minister Sylvi Listhaug of the Progress Party controversially claimed on her own Facebook page that the Labour Party put the interests of terrorists above national security. The public and political outrage that followed forced Listhaug to ultimately apologize for her inflammatory statement and resign her government post. Many think Listhaug’s Facebook post emboldened racists and anti-Islamists to send their threatening messages, although nearly all hide behind anonymity. Now police in Oslo who specialize in tracking online crime think they have a good chance to expose the offenders. “It’s very important to reveal the extent of this type of crime,” Lillebakken of the Oslo Police District told Aftenposten. She stressed that threats, discriminatory remarks and hateful content are not covered under constitutional guarantees of freedom of expression. Frode Elgesem, who coodinated all the lawyers appointed to support victims’ families and survivors of the July 22 terrorist attacks, welcomes the new police response to the threats against the AUF members. Many have since left politics and stopped expressing themselves publicly, which he considers a result of the pressure against freedom of expression itself. He also urged anyone receiving such hateful messages to report them to police, “to get the extent of them known and tackled.” He said they are covered under several portions of the law and can result in prison terms or fines.